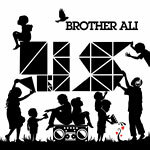 Staying true to their soul and blues influence that the combination of Brother Ali and Ant have become known for, Us takes on a more lush and dense sonic quality with the duo's incorporation of live instrumentation. With guest appearances by Chuck D, Freeway, Joell Ortiz and Stokley Williams of Mint Condition, Brother Ali and Ant have once again crafted a beautifully intelligent and entertaining album for all. So while his other material has been very personal and political, Ali seems to be at ease with this one and making it a little more light on subject matter and just putting out a quality hip hop album. Open copy played in our store. Near mint except small black pen mark through bar code.